. 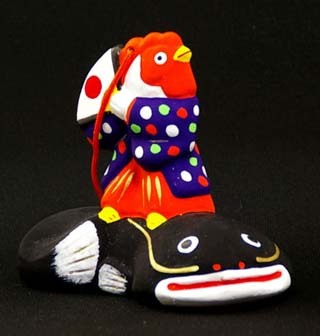 Folk Toys from Fukushima . Made of Wood, calling in good luck for the owner. See below more photos from the collection of Saito San. The most important of the Aizu Papermachee Dolls is the Red Oxen, Akabeko. The red color is auspicious for warding off illnesses. 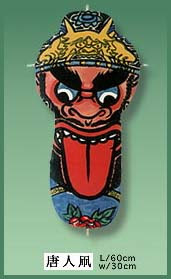 Many papermachee dolls of the Aizu area are called "Red Things" (akamono) for this reason. Red things are also good luck symbols for childrearing. Princess　Dolls as rolypoly. Made by Yamada san. 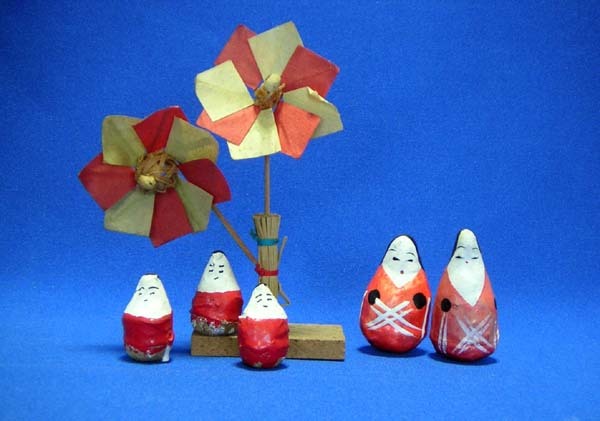 Princess Daruma rolypoly Dolls. Made by Yamada san. The tree auspicious things from Aizu are this Doll, water wheels and a pipe made from bamboo which sounds like a first nightingale in spring (hatsune). You buy Daruma dolls at the New Years Market, one figure more than members of the household, put them on the God's Shelf (kamidana) and pray for the good luck of the family and a good silk harvest. 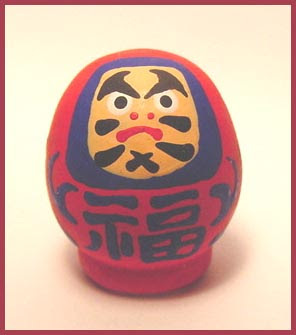 now in the fourth generation, makes Okiagari Koboshi 起き上がり小法師 small Daruma statues, now with the wish to help Tohoku come back on its feet. 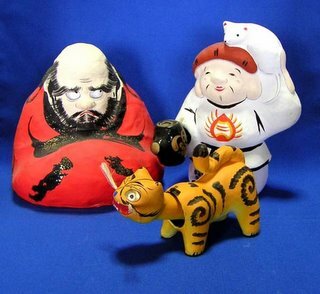 These dolls have been made since 400 years, then the lord of the domain, Gamoo 蒲生公 had them produced as a regional souvenir and an amulet to keep people healthy. Each family has to buy one more that family members with the wish that the family will always prosper and the line never die out. They were designed by Kuri Jooei 粟城栄 from the Igarashi store. They are quite simple and pure and bring out the fascination of papermachee dolls. Aizu no Anesama 会津の姉様 "Aizu sisters"
Aizu no Anesama 会津の姉様 Sister Dolls made from folded pieces of cloth, mainly in indigo colors. Their head decorations were made from gold and silver strings.
. Anesama ningyoo 姉様人形 "elder sister" dolls . The ones on the left are from Aizu, with a sharp head. The ones on the right are from Miharu. made since about 40 years. 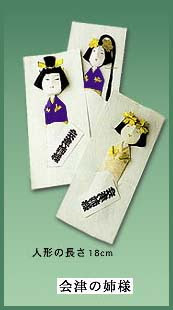 They are made by plastering washi paper on special molds and not as detailed as real handmade papermachee dolls. 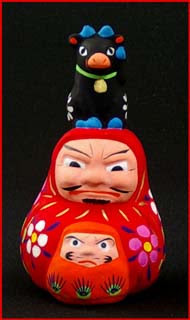 The themes are Daruma, a tiger wiggeling its head and Daikoku with a mouse. They have a history of more than 500 years. They represent a dance for good luck for soldiers before they had to go to battle. They also bring good health and ward off evil. The most important of these battles was the Boshin Senso in 1868, a civil war between Tokugawa loyal forces and the new Meiji government troups. The loyal samurai of Aizu were famous for this last battle.
. . . CLICK here for Photos of the dancers ! 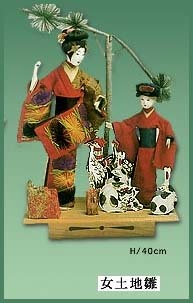 The craft of 'hariko' (papier-mache) is also called 'harinuki' or 'haribote' and was brought to Japan from China. During the Muromachi period, papier-mache dog figures were popular among the nobility. By the Edo period, there were many paper-production centers all over Japan. 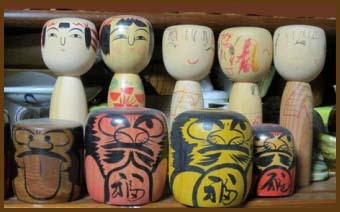 Many kinds of papier-mache toys and good-luck figures were made around Japan, with characteristics unique to each region. In the Edo period, there was little chance for exchange both within and outside the country, owing to Japan's long period of isolation. So, people produced toys reflecting each region's lifestyle or beliefs. 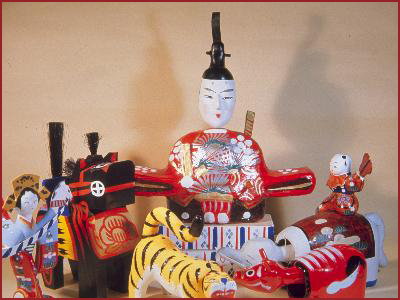 Papier-mache toys, such as these, have been called 'local toys' since the early Taisho period. Most local toys are to wish for health to a growing child, good luck, prosperity in business or abundant harvest. 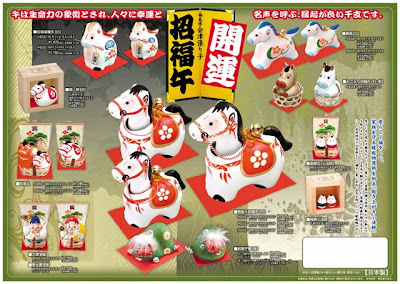 It is said that Aizu papier-mache developed as an additional source of income for samurai in the Aizu Domain; the red cow toy is especially famous. There is something lovely about the way these little red cows shake their heads. 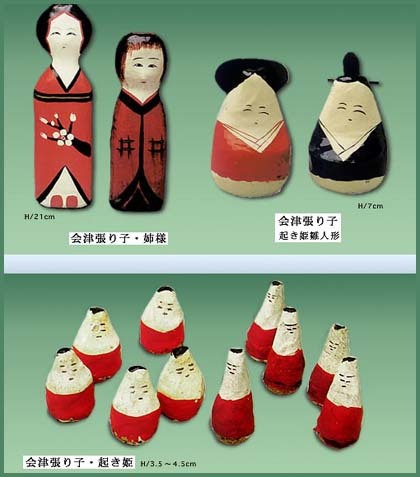 made by Aoyanagi Morihiko 青柳守彦 in a traditional way, with a rather comical touch.
. . . CLICK here for Photos from Aizu Clay Dolls ! They were made by the company Takefuji 竹藤, a sake brewery, which has a history dating back to 1624. The daimyo of Aizu, Gamoo 蒲生, had been baptised as a Christian and had close connection with Nagasaki and the Chinese merchants there. Around 1764, the people of Aizu developed a special way to grow ginseng 高麗人参 koorai ninjin ("Korean carrots"). One of the ginsen merchants, Adachi Juuroo 足立十郎 had the kites made to honor the Chinese merchants. 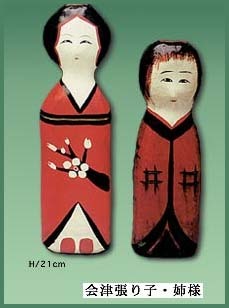 They are a kind of hina dolls (for the doll festival on March 3). They have been made by the grandfather of Kuri Jooei 粟城栄 from the Igarashi store.
. Bandai Atami no hariko 磐梯熱海の張り子 papermachee dolls from Bandai Atami .
. akabeko　あかべこ　Aka-Beko .
. 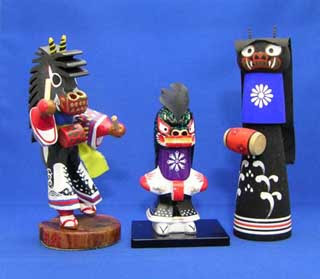 Folk Toys of Japan . Join the friends on facebook !